Congratulations for Pregnancy: Send your best wishes to be a part of a couple’s magical journey of getting pregnant and slowly inching towards becoming a mother and a father. From inspirational quotes to sweet notes to funny jokes to motivational messages – this post is a beautiful fusion of ideas which you can use to eventually write your own words. Lovely greetings are a must but don’t just stop there. Expecting a baby is too precious a journey to be marked with a measly card. Flood the expecting mommy’s Facebook, Twitter and Pinterest with the cutest posts. Let your heartfelt words be the encouragement that helps her get through the ups and downs of one of life’s most wonderful journeys. 1) Pregnancy is the only time in life when you’ll fall in love with someone you haven’t met. Congratulations. 2) Enjoy your pregnancy because it is the only time a woman can get away with burping and farting and a man can get away with blaming his wife for her irritable mood swings. 3) You have just been fired from your job of being just a woman. Congratulations for being accepted as an intern for the next nine months in your new job of being a mother. 4) Even after the nine months, to be a part of creating a new life is a thought that you will never be able to completely fathom. 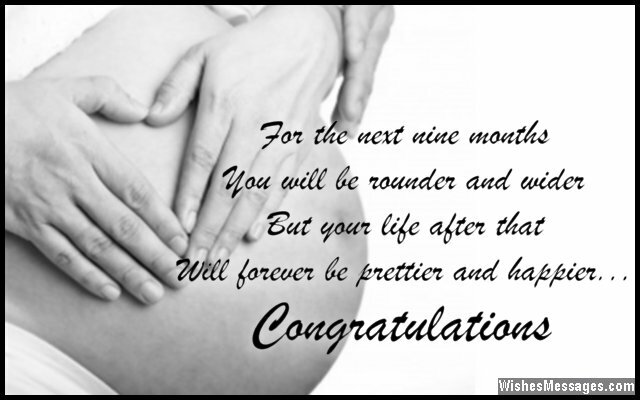 Congratulations for embarking upon one of life’s most precious miracles. 5) Nothing comes close to the feeling of nurturing a life inside your body. It has never been aptly described in words and it never will be. Experiencing is the only way to find out. Congratulations for getting yours. 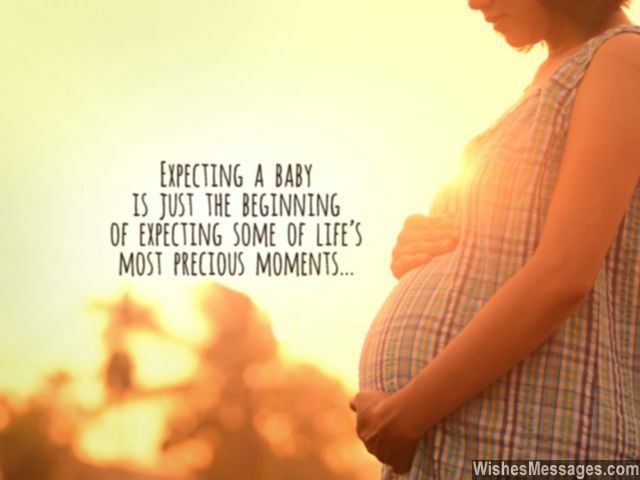 6) Expecting a baby is just the beginning of expecting some of life’s most precious moments. Congratulations. 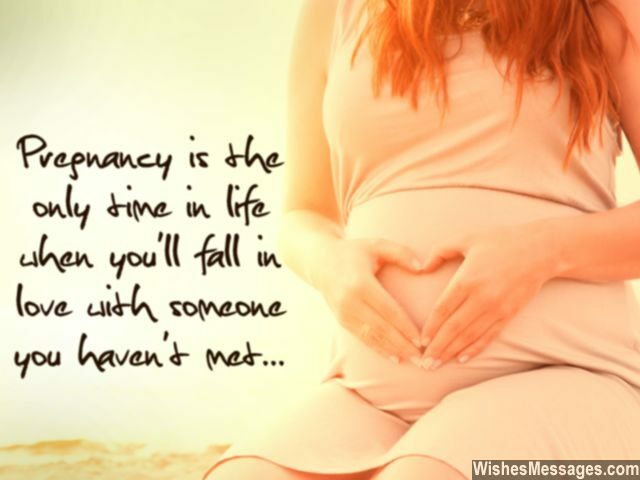 7) Pregnancy is when you’ll truly understand the meaning of being unconditionally caring and patiently selfless. Congratulations. 8) If pregnancy were a cocktail, it would be a mixture of two tablespoons of Romance, one tablespoon of Passion and three tablespoons of Love all mixed together in the spirit of Life. Congratulations for getting pregnant. 9) I am happy for your pregnancy but I am happier in knowing that a baby will be born in the arms of such loving parents like you. Congratulations. 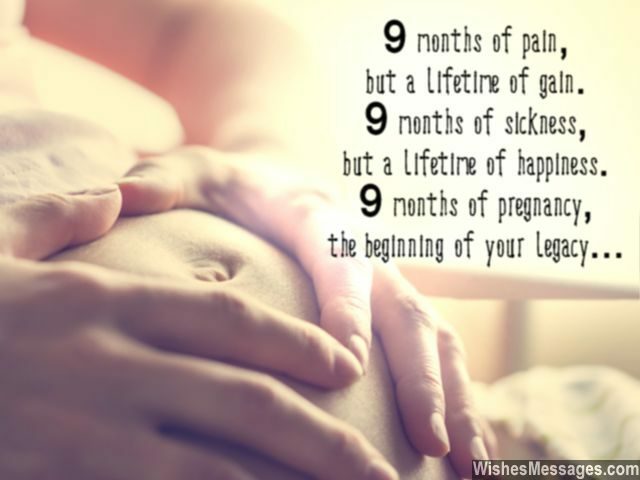 10) Pregnancy will take over your life for the next nine months, to give you happiness that will last you a lifetime. Congratulations. 11) Your body will go through many changes as pregnancy has its way with you. 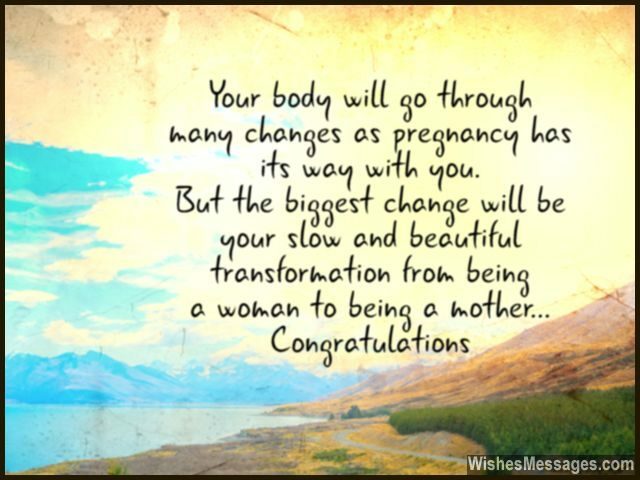 But the biggest change will be your slow and beautiful transformation from being a woman to being a mother. Congratulations. 12) Pregnancy is a wonderful miracle, and in nine months your joys will double. Congratulations, to the happy couple. 13) For the next nine months your body is a sacred place and your womb will be the closely guarded doors protecting the little angel who will change your lives forever. Congratulations for your pregnancy. 14) In the movie of your life, pregnancy is the twist that will change it all. Congratulations. 15) Pregnancy will make you see LIFE in a whole new different way. Why? Because you will experience what it feels like to create one. Congratulations. 16) The changes in your body will last for just nine months, but the beauty of motherhood will embrace you for the rest of your life. Congratulations. 17) Expecting a baby is the hardest and the most pleasurable wait you’ll ever have in your life. Best wishes for your pregnancy. 18) The beginning of your pregnancy is when you’ll never feel alone, even if you are… for the rest of your life. Your baby’s heart will forever live within. Congratulations. 19) The craziest roller coaster ride in the world is not at Disneyland or Universal Studios – it is the nine months of pregnancy. Good luck and enjoy the twists and turns. 20) To have another life take shape inside your own body is an experience that will change you forever. Congratulations. 21) 9 months of pain, but a lifetime of gain. 9 months of sickness, but a lifetime of happiness. 9 months of pregnancy, the beginning of your own legacy. Congratulations. 22) Beautiful things will happen in your life when you understand the power of loving unconditionally, and pregnancy is just the beginning. Congratulations. 23) To be a woman is one thing. But to be a mother, is a whole new level. Congratulations for taking your first steps towards discovering a new dimension of life. 24) While you will only carry the baby in your womb for the next nine months, you will carry it in your heart for the rest of your life. Congratulations. 25) Stop reading books about babies and getting pregnant because the beautiful feeling of pregnancy is impossible to be understood in words – it can only be experienced and felt from within. Congratulations. 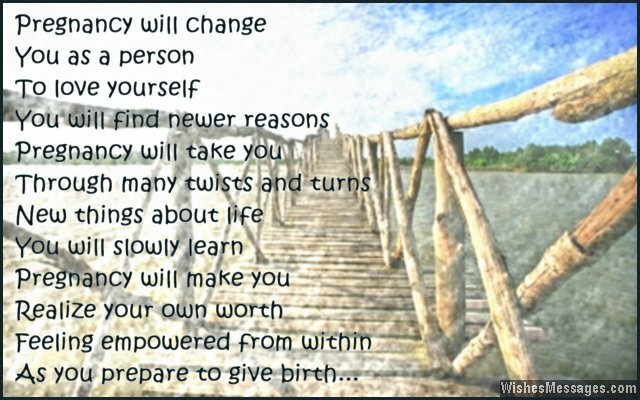 26) Pregnancy will change you as a person. To love yourself, you will find newer reasons. Pregnancy will take you through many twists and turns. New things about life, you will slowly learn. Pregnancy will make you realize your own worth. Feeling empowered from within, as you prepare to give birth. Congratulations. 27) The bitter-sweet pain and discomfort will be all worth it when you get life’s sweetest gift after nine months. Congratulations. 28) The most inspirational thing that pregnancy will teach you is the realization of how even pain and sickness can be gateways to lifelong happiness. Congratulations. 29) Congratulations on your pregnancy. 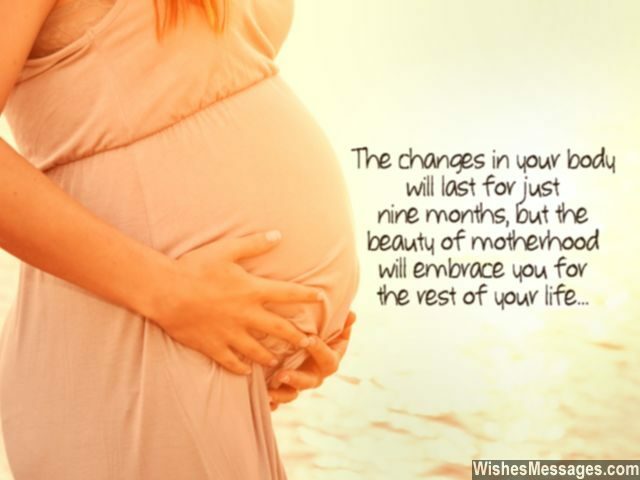 You have just embraced motherhood – the most beautiful and life-giving journey that any has ever treaded upon. 30) This is a piece of advice for the to-be-mommy. Make the most of your nine months of pregnancy because it is the only time when you can bite into all your food cravings to put on those extra pounds without feeling an ounce of guilt. Congratulations on getting pregnant. 31) For the next nine months, you will be rounder and wider. But your life after that, will forever be prettier and happier. Congratulations. 32) The most inspirational part of your pregnancy is that you are actually creating not just a new life, but your legacy which will live on even after you are gone. Congratulations. 33) Have you ever wondered why a woman would ever want to be pregnant despite the nausea, mood swings, temper tantrums and hormonal fluctuations? You are about to find the magical answer yourself. Congratulations. 34) Metaphorically, pregnancy is Mother Nature’s way of telling you that you have finally stopped being a girl and started becoming a woman. Congratulations for becoming pregnant. 35) Congratulations for entering a period of life when you will have no periods. 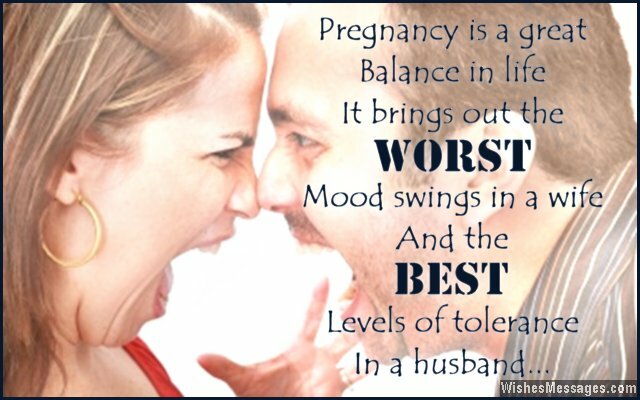 36) Pregnancy is a great balance in life – it brings out the worst mood swings in a wife and the best levels of tolerance in a husband. Congratulations for getting pregnant and finding your balance. 37) Congratulations for your pregnancy. Do you know what this means? New clothes, maternity leave and lots of pampering from the daddy to-be. Enjoy being spoilt like a princess in this adorable phase of your life’s new beginnings as a mommy to-be. 38) The downsides of pregnancy including extra weight, stretch marks and hormonal fluctuations are nothing as compared the upsides which include a lifetime of love and affection of your child. Wish you a very happy pregnancy. 40) Pregnancy is the only time when you’ll love someone even if the kick you in your tummy and give you sleepless nights. Congratulations.